You can test to see if the peas are cooked by crushing them against the lid of the pot. (If they crush easily, you are ready to move on to the next step). NB - If you are using tinned peas jest add them to the pot and move straight on to the next step. 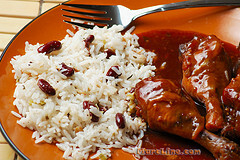 Love me some rice 'n peas!